We’re back. After 6 weeks back in the UK with family we made the hard decision to head back to Asia and continue the trip. 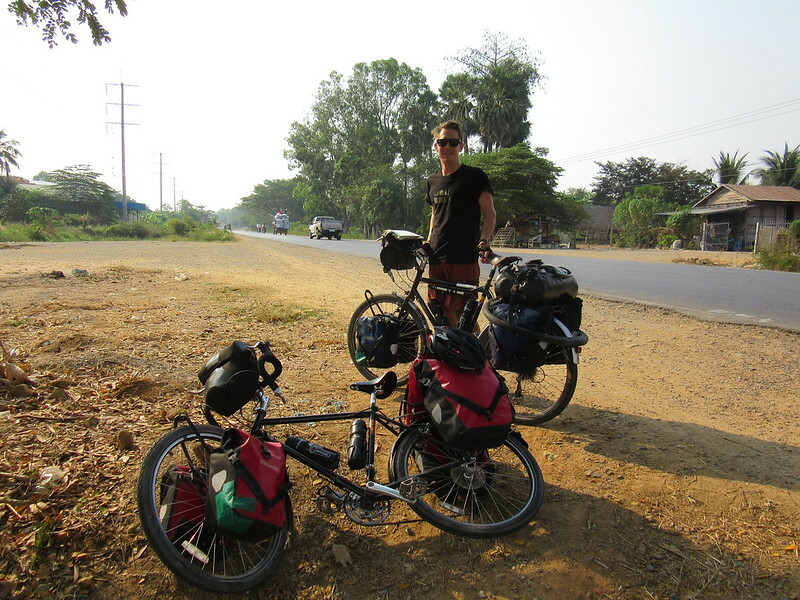 We’d almost reached the Vietnam border when we flew home from China last year, packing up our bikes and all our panniers and taking them with us. This at least gave us the flexibility to fly back to wherever we wanted to, whenever we were in a position to continue. 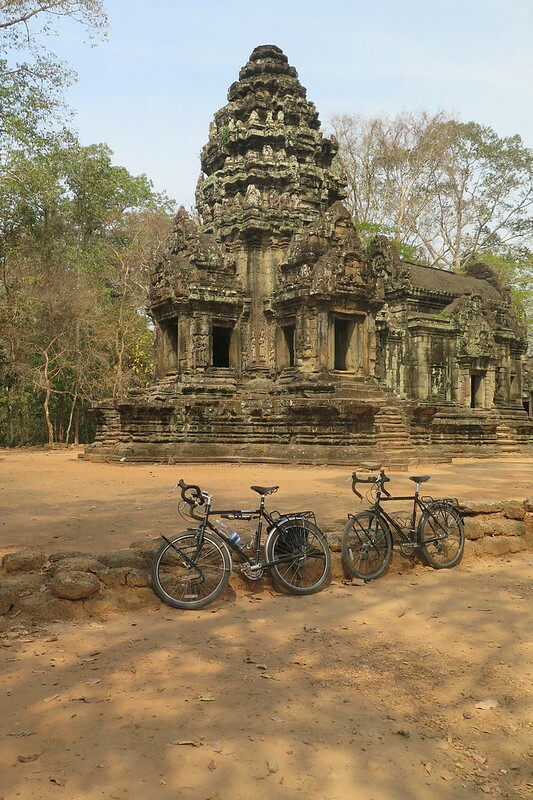 We’d planned to spend the winter months cycling in South East Asia so looking at our rough timescale, Vietnam was cut out and we flew into Cambodia, meaning we could rejoin roughly in the same place as we would’ve been. 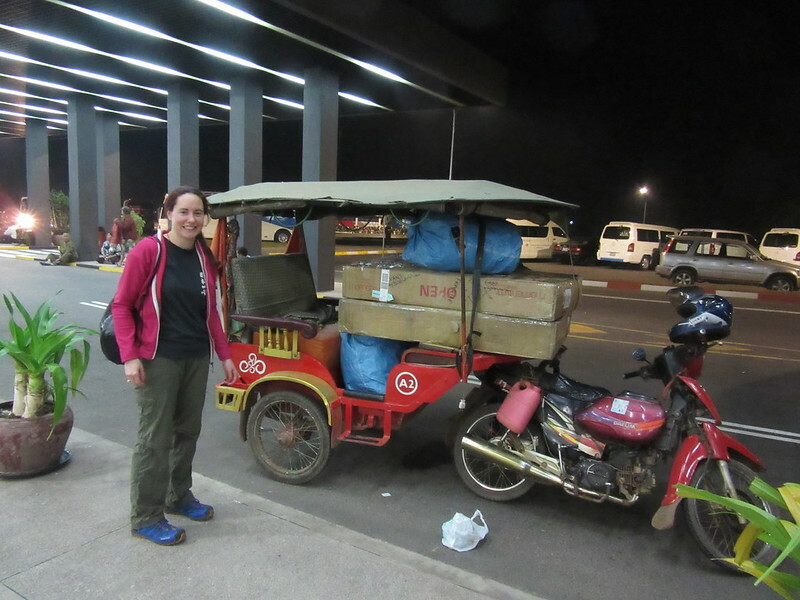 We arrived at Siem Reap airport late on the evening of February 11th, with our bikes boxed up and our panniers in a large sack, about 45kg of luggage each. We’d booked a guest house and had pre-arranged transport to pick us and all our stuff up from the airport. All was going smoothly, our bikes came through undamaged, we cleared customs quickly, and a guy was waiting for us as expected. But he looked slightly concerned when he saw the amount of luggage we had, and told us he only had his tuk-tuk to take us the 30 minutes to the guest house. Somehow, we squeezed everything in and hung on, literally on the edge of our seats, for the bumpy ride into town. We have a 30 day visa and only a short distance to get to our next country, Thailand, so we were in no hurry to get moving. 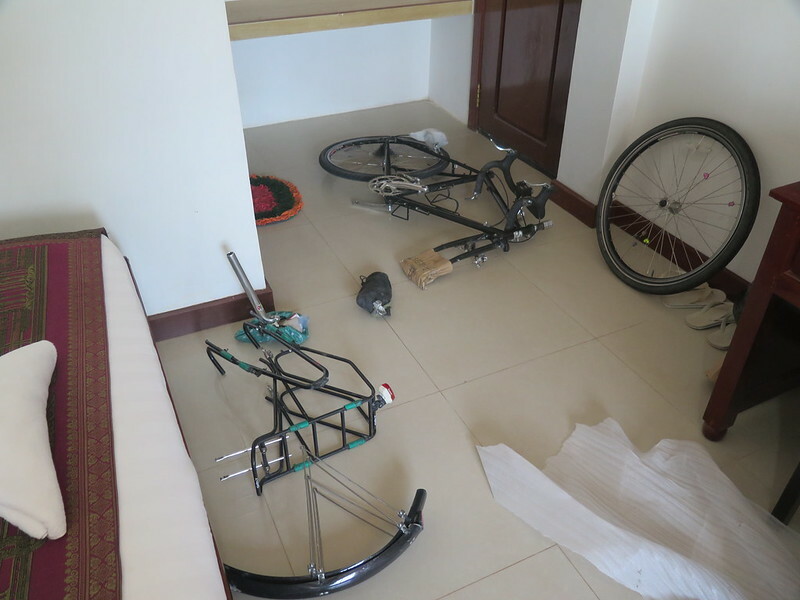 Our first day was spent rebuilding the bikes and relaxing in our room with the odd foray out into the heat for cold drinks and food. 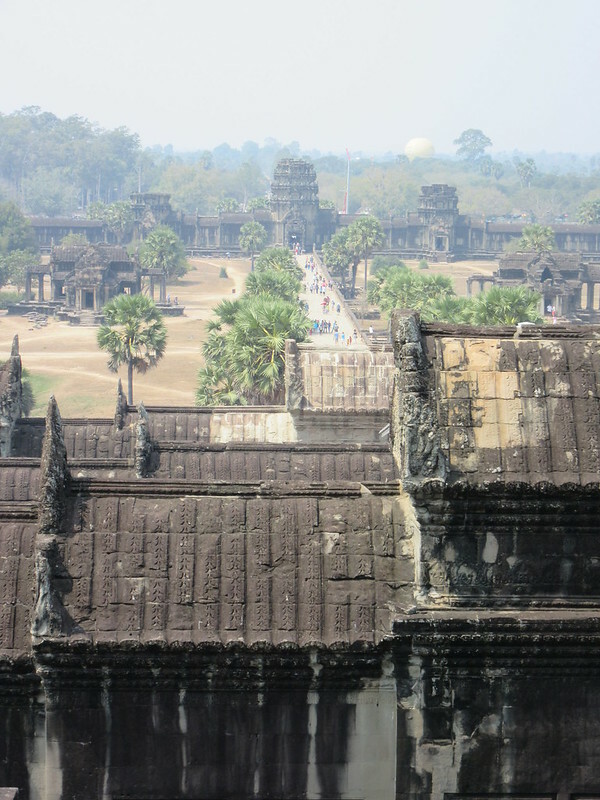 Then for the next few days we planned to cycle around and explore the huge temple complex of Angkor Wat, just north of Siem Reap. 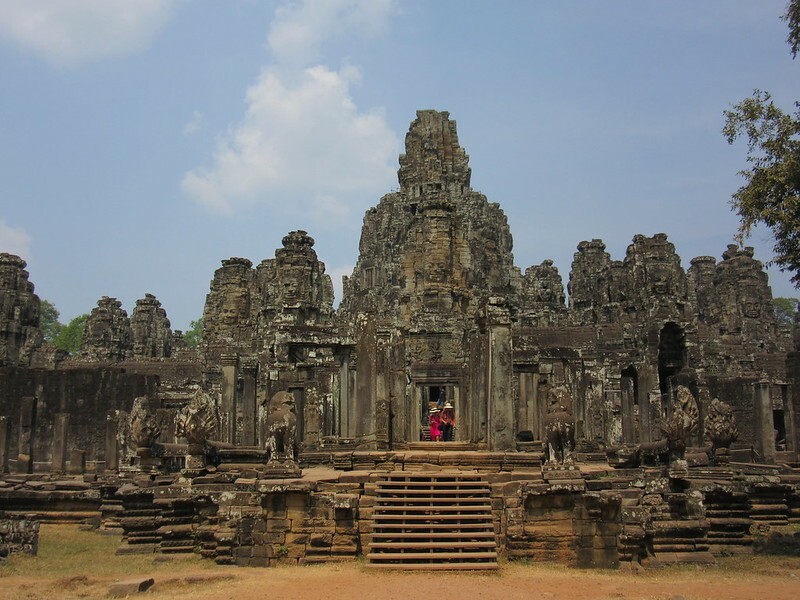 It’s one of the biggest tourist spots in South East Asia, so we were expecting the crowds. It’s easy to be snobby and roll our eyes at the masses, but we’re all there for the same reason so we were ready to join the queues and wait to get our photos of the famous sights. But actually it wasn’t too bad. 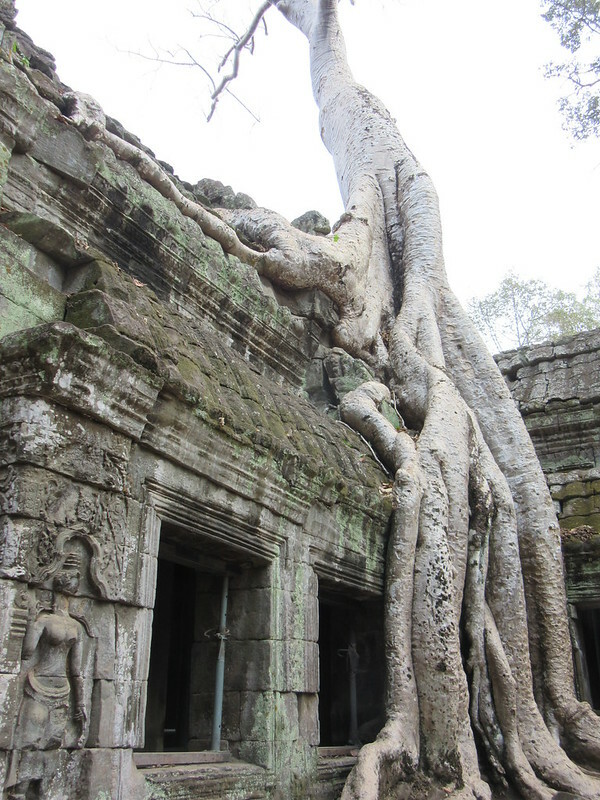 Of the ‘big 3’ temples, it was only really Prasat ta Prum (the Tomb Raider temple) which lost some of its magic as we shuffled around with hundreds of others. 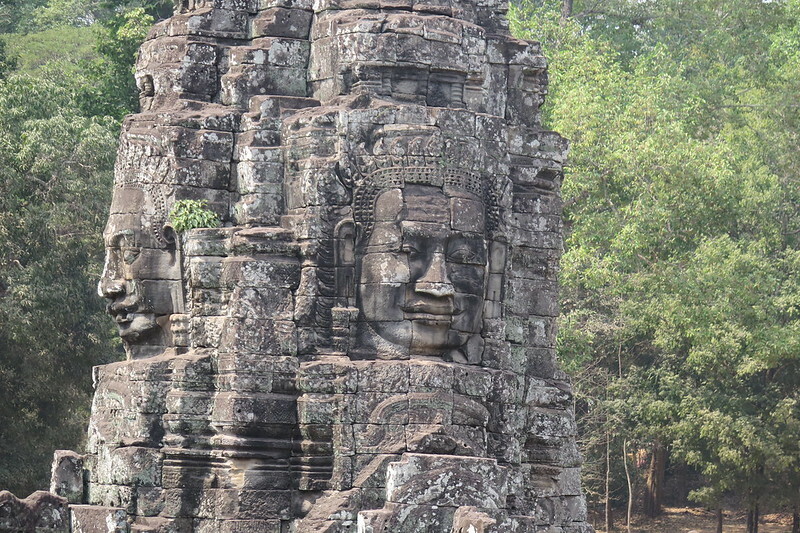 The other two, Angkor Wat and Bayon, were more impressive than we expected and really not too busy. Having our bikes was great too as it gave us the freedom to explore a bit more and go at our own pace. We could escape the swarms of tuk-tuks and tour buses to visit many of the other temples and ruins, of which there are hundreds. 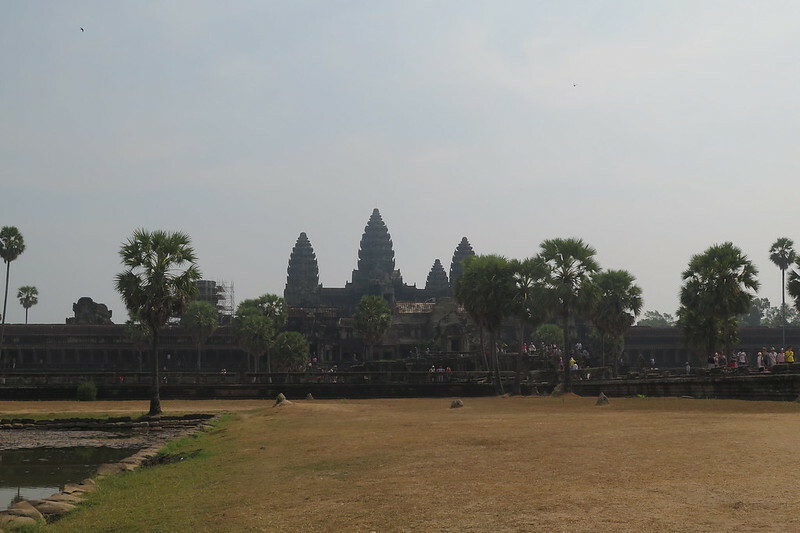 We got the 3 day pass for Angkor Wat, cycled 30-40km each day, saw a sunrise and a sunset, and covered a decent amount of the complex without getting too ‘templed out’. 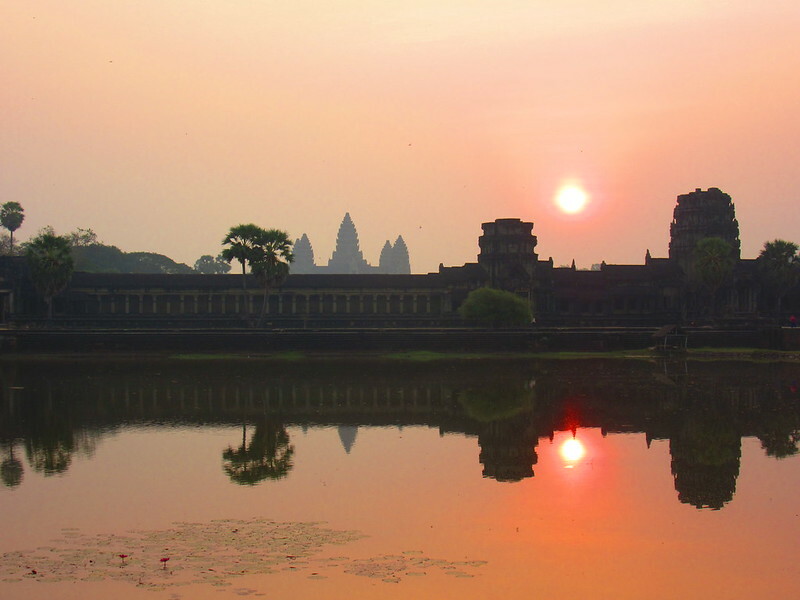 Siem Reap itself is a booming tourist town, with something for everyone, from cheapy hostels to brand new boutique hotels. The town centre has the bars, restaurants and markets that you’d expect in any South East Asian spot. 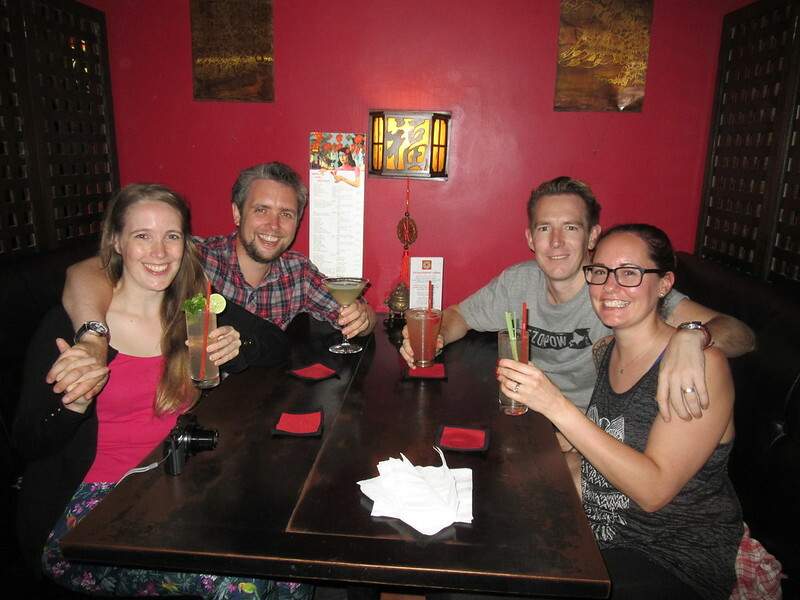 Purely by chance, our time there coincided with Todd (Clare’s brother-in-law’s brother) and his wife Vicky passing through on their backpacking trip and culinary tour of Asia and Australasia. (www.vickandtodd.wordpress.com) We spent three great evenings in their company, indulging in our shared passions of good food and a drink or two. Todd had scoped out several restaurants in town and we were happy to push the budget for some really excellent food. 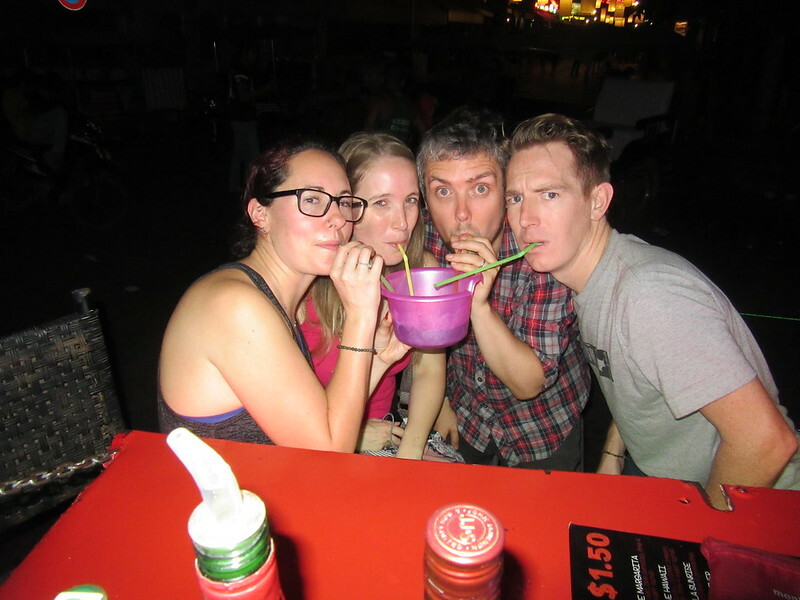 Quite how one of the evenings ended with us drinking cocktails from buckets in the street at 3am, I don’t know, but it was a great night out that we’ll remember for a long time! Enjoy the rest of your trip through Thailand, China and Japan, that promised email with everything you need to know about Japan is on its way! Hopefully we’ll work out a way to catch you in Thailand. 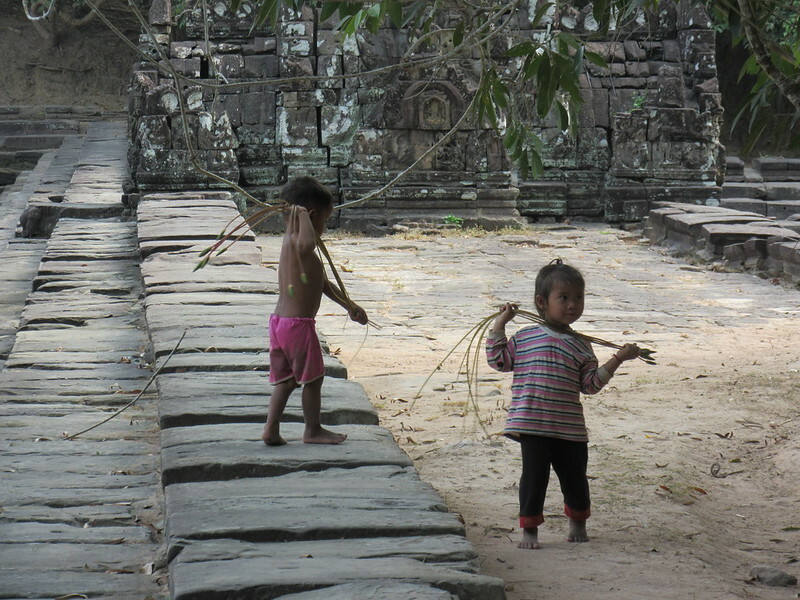 Nearly a week after we arrived, it was finally time to roll out of Siem Reap. We were looking at a zig-zag route, heading west, kinking south and then going west again to the Thai border. This was for a couple of reasons, firstly the border crossing at Poipet is reported to be very busy as it’s the main crossing point for the Bangkok – Cambodia tour buses. Also, we are wanting to get down to the Thai coast as quickly as possible, so the southern crossing at Pailin makes more sense for us. 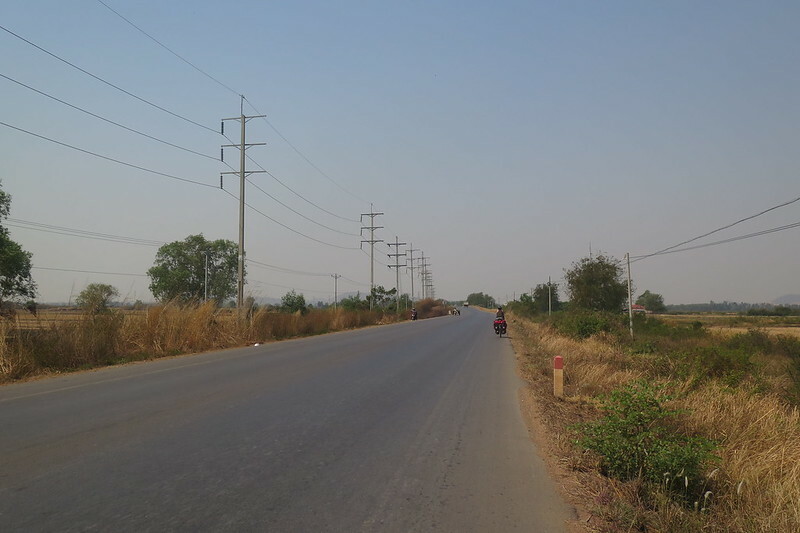 We set off around 10am, out of town on Route 6, one of Cambodia’s major routes. The road was good, smooth and flat, following a straight line west. There wasn’t much in the way of scenery, after 5km we were in the countryside with wide expanses of nothingness on both sides. We are in the middle of dry season at the moment, so everywhere is dusty and quite barren. The heat started to take its toll quite quickly, with very little shade around to give us any respite from the sun. 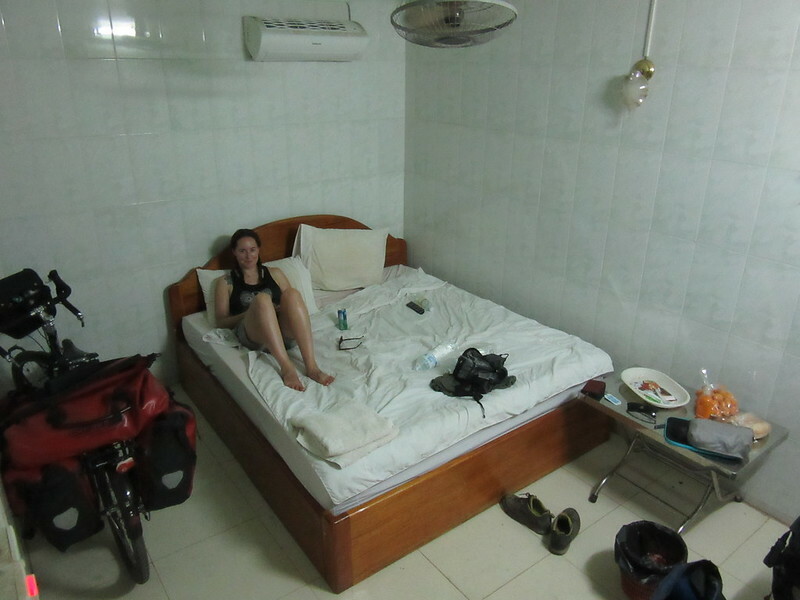 It was definitely a shock to the system to start back into cycling in such heat, 39 degrees at one point, after our last stretch through China in the autumn. By early afternoon, Clare was starting to feel like she was getting sunstroke. After 55km we saw a guesthouse at Kralanh and called it a day. We raced inside to the shade and air conditioning to recover from the sun stroke we both had started to suffer from. Lesson learnt. Start early. The following day was better, an early start meant we had most of the distance done before the sun was too high in the sky. We took more drinks breaks and rested in the shade when we saw it. It was only a short hop, 50km to Sisophon where we stopped for the day in a $6 guest house, the cheapest of our trip so far. We chilled for a bit through the hottest part of the day, then went for an explore and some dinner once the afternoon got cooler. There isn’t much to Sisophon, but it’s a the crossroads of Cambodia’s two major routes, so many pass through it. 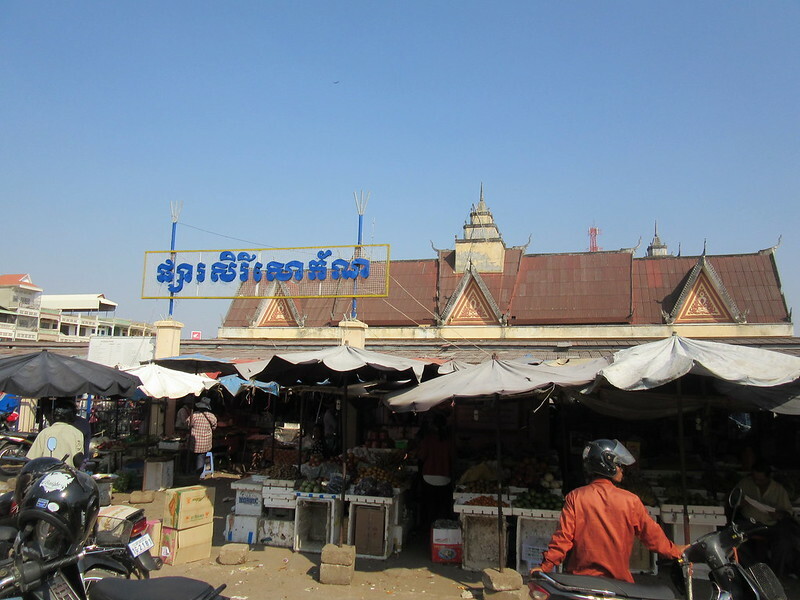 We had an interesting wander through town and the market area, quite a contrast from Siem Reap. We set off even earlier the next day, mainly as neither of us slept particularly well on a very lumpy mattress in our cheapy guesthouse. 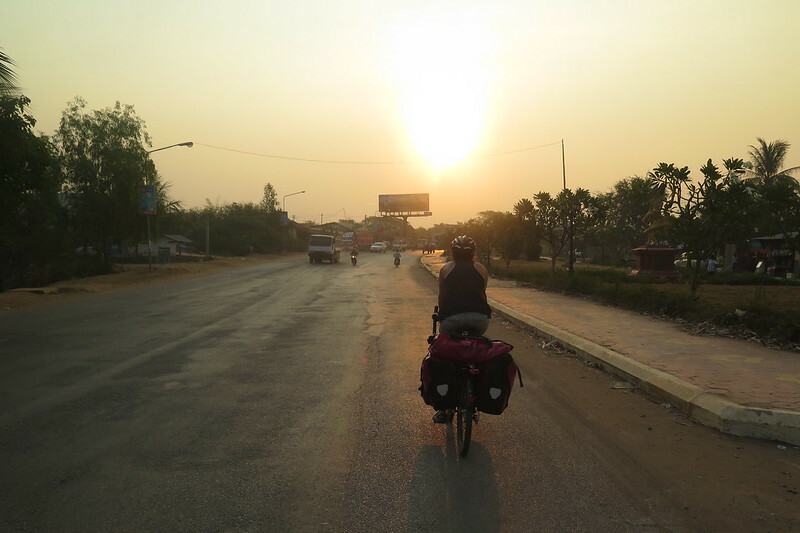 We joined Route 5 to head south towards Battambang as the sun was coming up. Just out of town we met two other touring cyclists. They had been on the road for a while, having travelled from Germany through Central Asia following a similar route to the one we have planned. 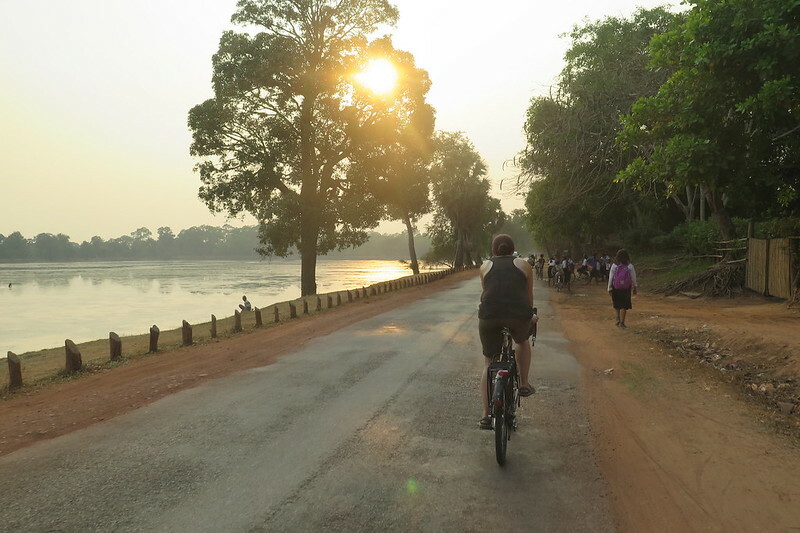 We’ve already seen a dozen or so other cyclists around Siem Reap and in our first few days on the road. That’s about 3 times more than we saw in our whole time in China. 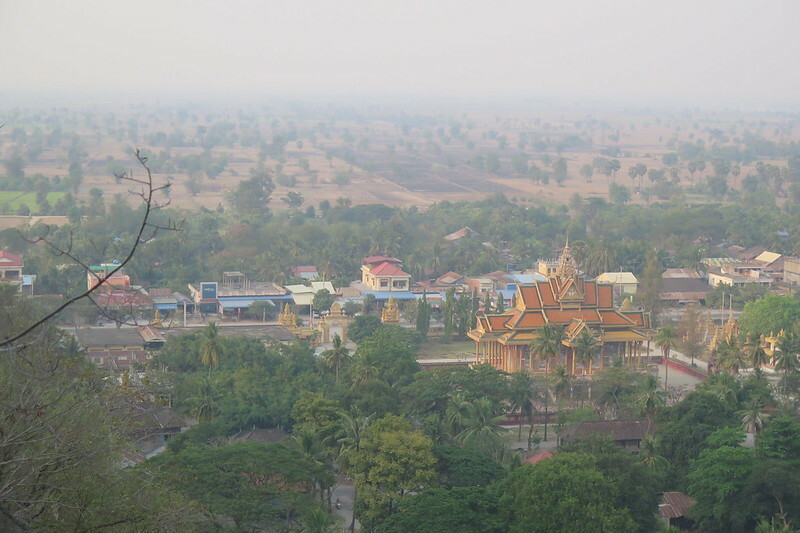 The route was a little more interesting towards Battambang, with more temples and villages to ride past. There was more tree cover too, which gave us more chance for breaks out of the sun once it got warmer. The road was quite busy, it’s the main road to Phnom Penh, but most of the time we were given a wide berth. 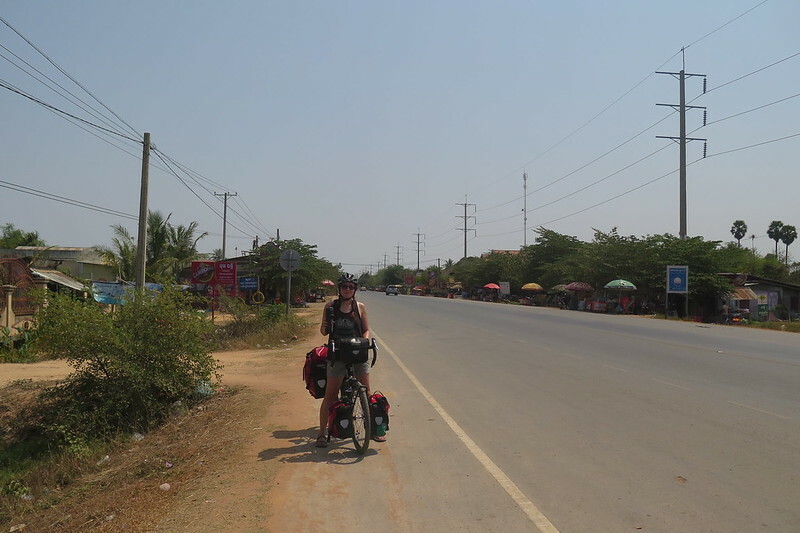 By 11 o’clock and after about 70km we reached the outskirts of Battambang, Cambodia’s second largest city. It’s a nice place, with a river running through the centre, lots of colonial French architecture and a developing cafe culture. We’ve spent a couple of days here, looking around the town and exploring a bit of the surrounding countryside. 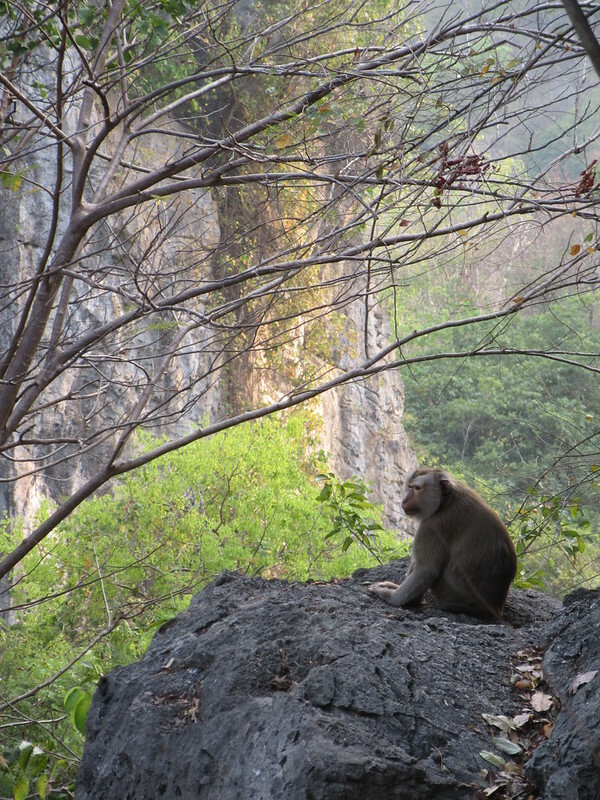 Just outside town, there’s a hill called Phnom Samphou which we went out to in the late afternoon. 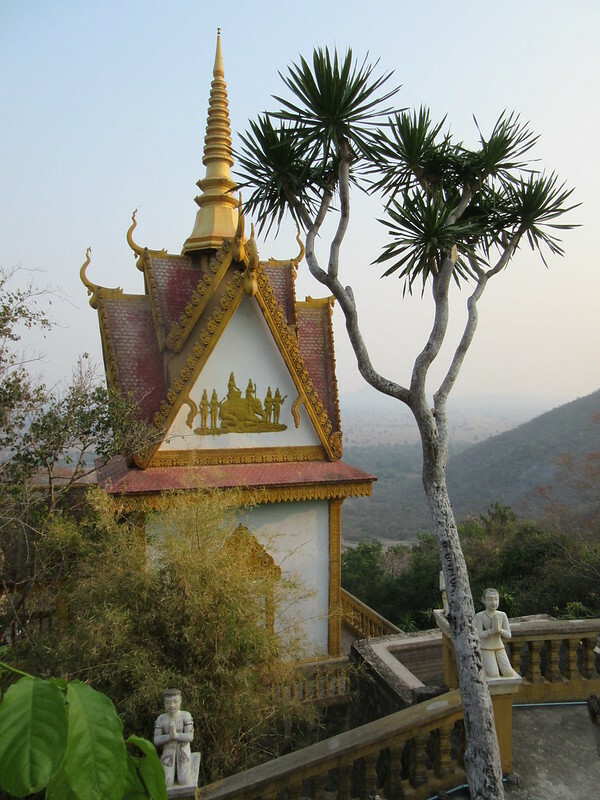 There’s a temple on top and a cave known as the killing cave, where thousands of locals were killed by the Khmer Rouge. Lots of tour guides and touts were there asking for money for unwanted tours, so we didn’t stick around for long. 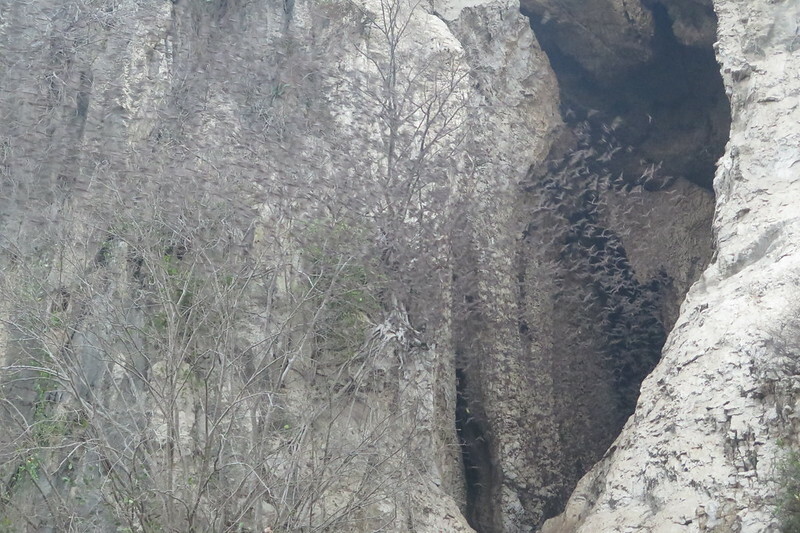 We had a bit of a hike checking the area out, and then once the sun started to set, we sat down with a beer to look at the main event – the Bat Cave. 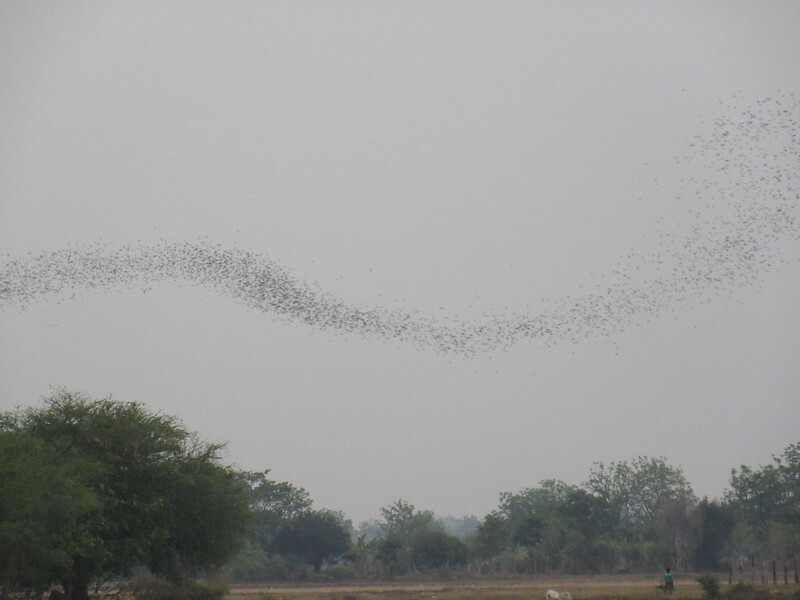 Every day at dusk, hundreds of thousands of bats fly out from the cave to hunt insects over the surrounding farm fields. 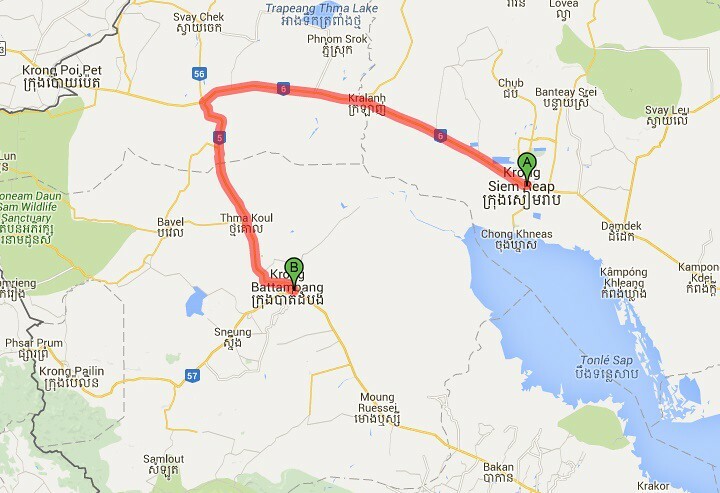 Tomorrow we’ll be setting off early to get to Pailin, a border town, and then crossing into Thailand the next day. 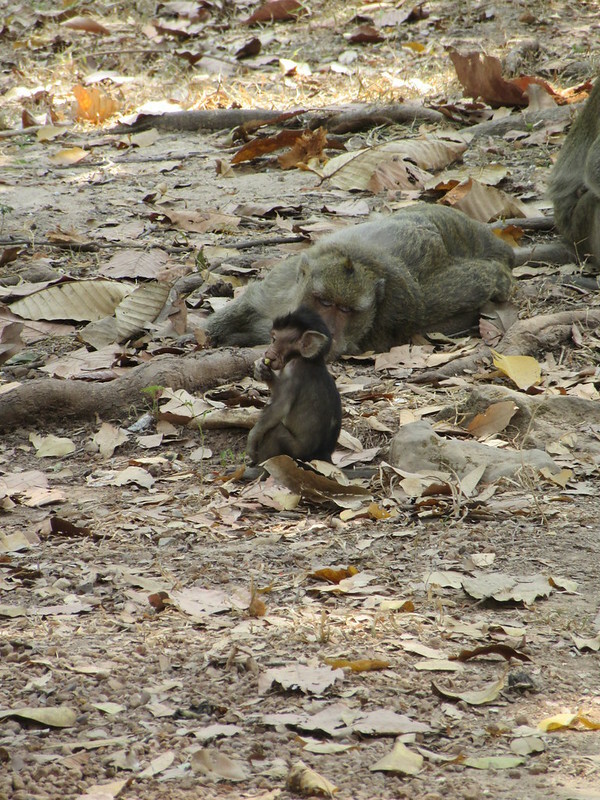 Just a short taster of Cambodia for us this time around, but it’s been enjoyable and the people friendly. The food in Siem Reap was excellent, but the same has been true of everything we’ve eaten from even the most rural street vendor. We weren’t tempted by any deep fried insects or spiders though. It’s good getting back into the cycling and slowly easing back into the trip after an unsettled time. We’re looking forward to Thailand and getting down to the coast for some time on the beach! ← Back in the saddle! Cycling in that heat sounds crazy..at my age I am probably mad to plan to do so! Hopefully in November you won’t have it quite as hot. But it definitely takes some getting used to! Can relate to the tuk tuk, we were in Thailand for Ben’s wedding recently, andrew entente Kho Lanta with Alisa’s family for a week therewere9 of us plus luggage,we actualy had a truck on that occasion, very ropy with no proper sides a real squash with all our luggage, great time though. Thanks Chriss. Yep, vehicles in South East Asia are always an adventure! Feel more comfortable on our bikes! Hi Rod and Jacky. Thanks again for reading! I heard from Sam that you’d been to visit them and were off travelling. Sorry to hear that you’ve been hit by the hurricane in Fiji! Sounds a bit close for comfort! I hope you can get your flight out and that the rest of your trip is enjoyable and not too eventful! I guess we spread the temples out and didn’t do full days! Thanks so much for taking the time to reply with some great advice on dealing with the heat! Will have a good read of your post from Central America too. Thanks man!